Who doesn’t love brunch? It’s one of the best parts of the weekend especially when it’s done right. 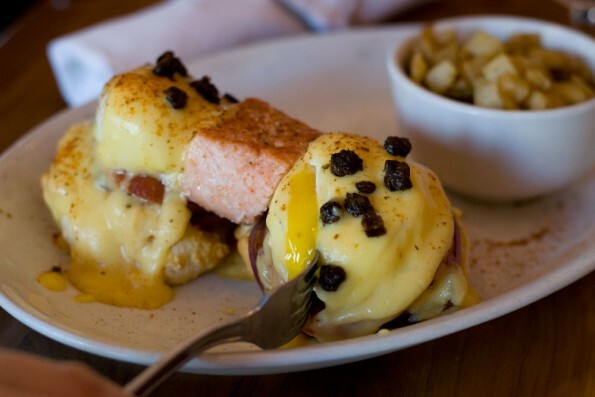 The Hash Kitchen is one of Scottsdale’s newest brunch hot spots and its definitely easy to see why. Located in The SHOPS Gainey Village, The Hash Kitchen has a fun, hip vibe (complete with a DJ playing on the weekends) that feels young but is not intrusive. The first thing you see when you walk in is the Build Your Own Bloody Mary Bar. We spoke with Adrian, one of The Hash Kitchen’s Bloody Mary Stylists, he told us about how much work goes to preparing all of the components in the BYOBMB. The BYOBMB boasts 40 different toppings, home made salts (celery and bacon), and vodka infused in house (jalapeno, bacon, cucumber, cilantro lime and smoked salmon). The Bloody Mary mix comes in three levels of spiciness: mild (standard seasoning), medium (chile pepper), and hot (habanero). Among the toppings are: bacon, beef jerky, salami, pickled vegetables (the brussels sprouts were incredible! ), olives, traditional vegetables (celery, carrots, olives) and even fresh blue point oysters! 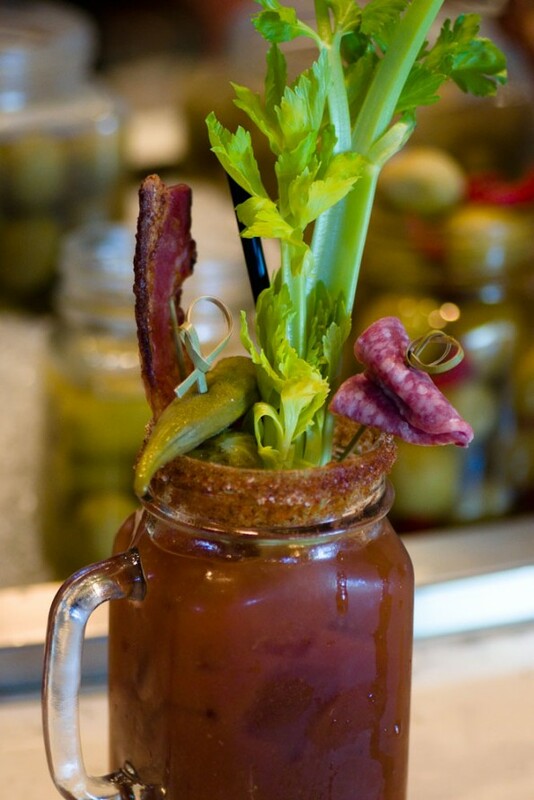 We always thought we didn’t like bloody marys but it turns out we just don’t like bad bloody marys. Hash Kitchen has some of the best in the valley! We also tried one of their seasonal fruit mimosas and par for the course thus far, it was great! It wasn’t all fruit juice with a splash of bubbles but rather the opposite. After making a bloody mary we ordered breakfast. At the recommendation of our server we ordered the Lump Crab and Sweet Potato Hash and the Smoked Salmon Eggs Benedict. Both were absolutely incredible! The smoked salmon on the Smoked Salmon Eggs Benedict is smoked in house and is an actual piece of salmon versus the type you’d expect to find on top of a bagel. It is also topped with fried capers which are the perfect addition to anything with salmon. The most important thing to note here however, is that the eggs were PERFECTLY poached. For whatever reason, it seems that poached eggs being done correctly is a difficult thing to find in most breakfast spots. When we commented to owner Joey Maggiore that the poached eggs were expertly done, he told us that rather than making them in advance like a lot of restaurants, each egg is poached to order. This attention to detail showed in both of our dishes. The Lump Crab and Sweet Potato Hash was loaded with succulent lump crab, the eggs were also poached to perfection, and the potatoes were cooked exactly the way you’d expect in a hash. Both breakfasts were served with biscuits (on the side for the hash and as the bread component on the benedict) that were light and fluffy on the inside but nice and crusty on the outside. They also provided a good element of sweetness to both dishes. We had a truly fantastic experience at The Hash Kitchen. What a ray of light to find a brunch spot that would rather take a few extra minutes to make a meal right than rush it to get the customer in and out. While we love brunch the two biggest deterrents are poor food quality due to rushing and lack of original brunch options. The Hash Kitchen takes those and crushes them! The sign doesn’t lie, The Hash Kitchen definitely delivers on creativity and quality.